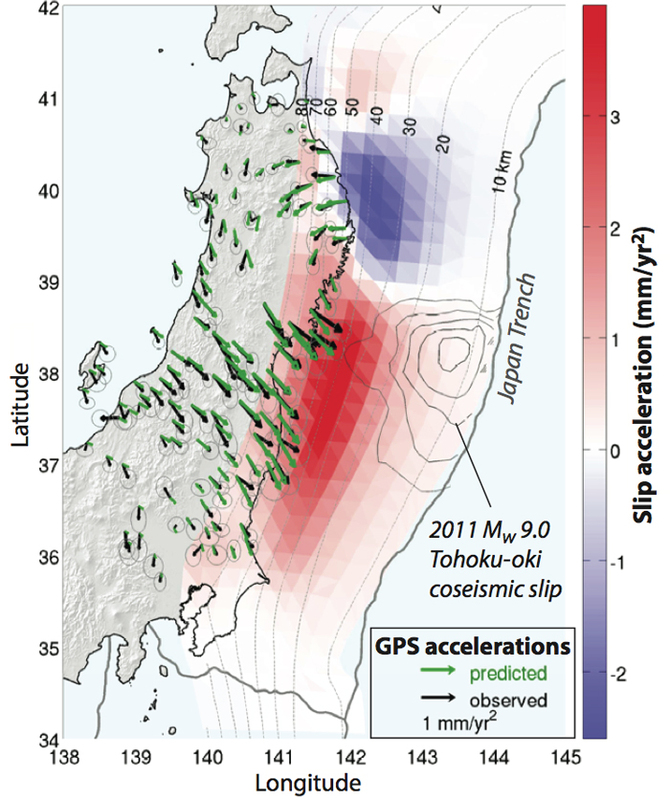 Analysis of GPS observations from 1996 to 2011 show that the northern Tohoku region of Japan was accelerating landward and the south-central Tohoku region was accelerating seaward. The northern movement is modeled primarily as post-seismic response to large earthquakes that occurred before 1996. The southern movement is modeled primarily as a 400-kilometer long section of accelerating creep along the offshore subduction zone. The measurements and modeling highlight the value of long term observations of seismic regions and the significance of movement between large earthquakes. The boundary between the North American and Pacific plate just offshore of the Tohoku region of Japan is a subduction zone where the Pacific plate dives under the North American plate at a rate of about 83 millimeters per year. The catastrophic moment magnitude (Mw) 9.0, 11 March 2011, Tohoku-oki earthquake occurred on this plate boundary. The authors analyzed horizontal position time series for 891 GEONET stations (i.e., GPS/GNSS network covering Japan) between 21 March 1996 and 6 February 2011. To estimate the long-term motion on land without the effects of large earthquakes, the authors subtracted the seismic and post-seismic motions of any large earthquakes since 1996. They also modeled and subtracted post-seismic effects from larger earthquakes that occurred in the decades before 1996. The analysis shows a small amount of landward acceleration in northern Tohoku and a larger amount of seaward acceleration in southern Tohoku. 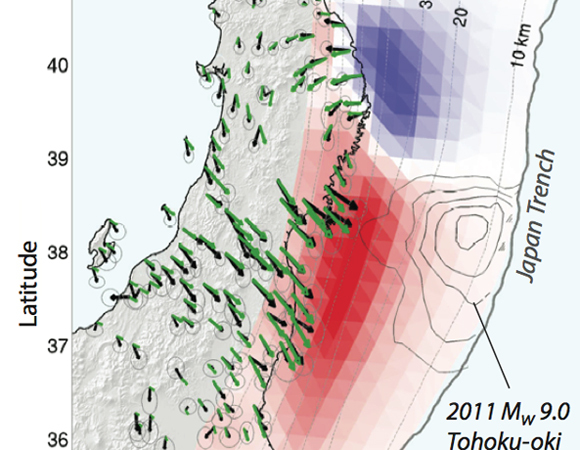 The landward motion is modeled as continued post-seismic deformation following the Mw 7.7 1994 Sanriku-oki earthquake, associated with decelerating creep along the offshore subduction zone, a well-understood phenomenon. The seaward motion, on the other hand, is an unexpected finding and is modeled as a combination of increasing slip rate on the Japan Trench plate interface and upward migration of aseismic slip along the dip of the plate interface during the 15 years before the Tohoku-oki earthquake. These results highlight the slower, subtler, and sometimes surprising signs of accommodation of the collision of major tectonic plates and the need to understand these subtle motions to understand major earthquakes. 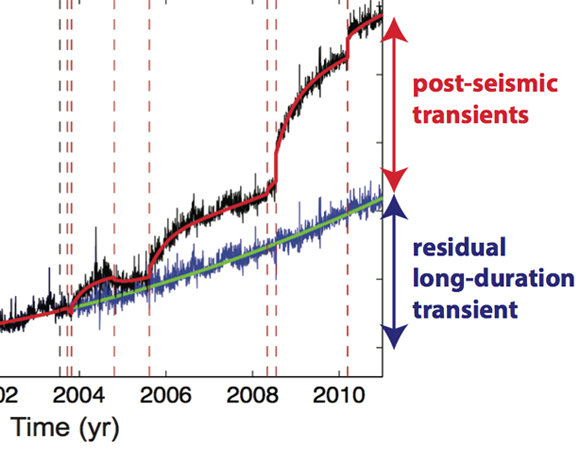 References: Mavrommatis, A.P., P. Segall, and K. M. Johnson (2014), A decadal-scale deformation transient prior to the 2011 Mw 9.0 Tohoku-oki earthquake, Geophys. Res. Lett., 41, doi:10.1002/2014GL060139. Send questions or comments about this page to Science science unavco.org.